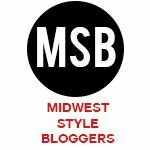 It’s time for another What I Ate Wednesday post! I know not everyone enjoys looking at what other people eat throughout the day, but I love it because it gives me new ideas for meals! I realized the other day most of my Instagram feed these days consists of Whole 30 and Paleo accounts which are great inspiration. Here is a look what I ate on Monday this week. Breakfast | As you probably know from previous posts, I eat my breakfast once I get to work in the morning. 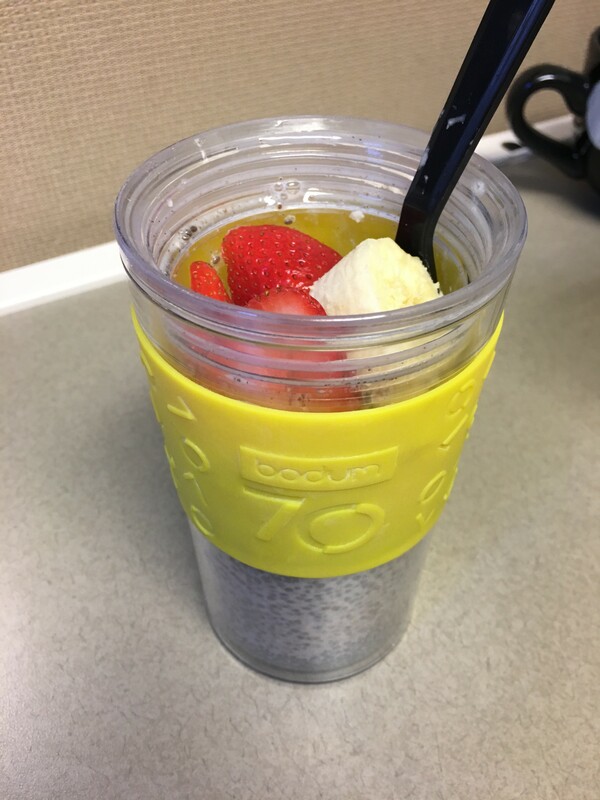 This week I have been making chia pudding at night which has been a nice change from my usual green smoothie. This combination is just 1 cup unsweetened vanilla almond milk + 3 tbsp chia seeds + 1 tsp cinnamon. As it sets overnight, the chia seeds become gelatinous and form a pudding like texture with the milk. I’ve been topping mine with sliced bananas and strawberries. Delicious! 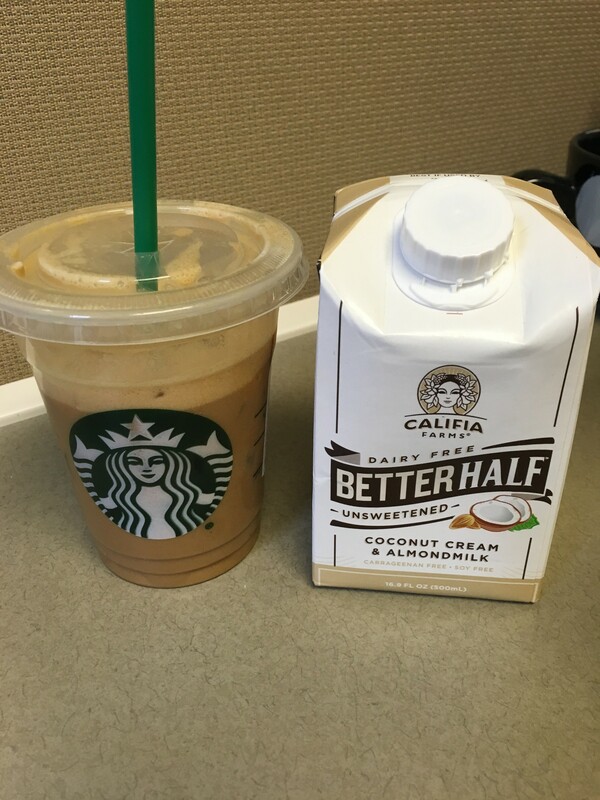 I’ve also been on an iced espresso kick lately and found this awesome coconut cream + almond milk creamer at Whole Foods that I’ve been adding in. It tastes like Hawaii in a cup! So good! LUNCH | This week I prepped a bunch of salads for my lunch at work. 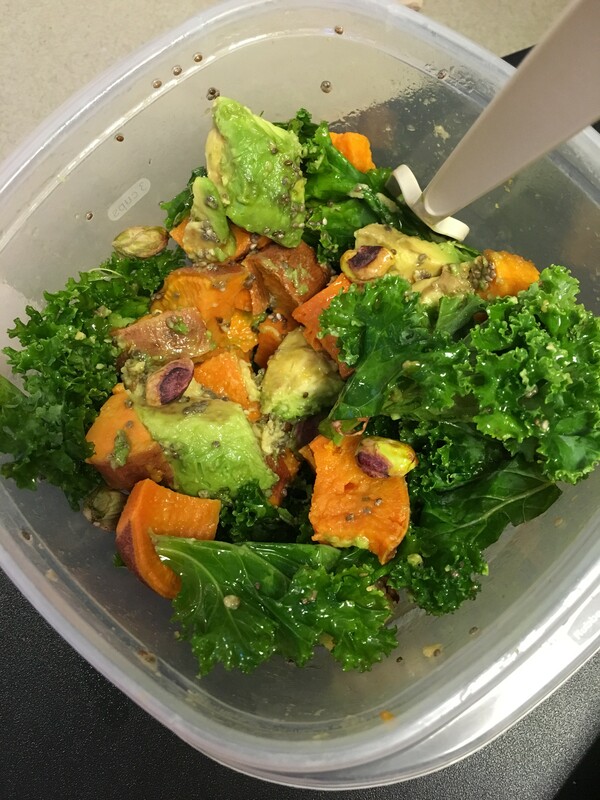 I used kale as the base and topped it with roasted sweet potatoes, avocado, pistachios, and a sprinkle of chia seeds. I made a vinaigrette using lemon, red wine vinegar, and olive oil. Simple yet delicious! We have a snack table at work so I generally grab a couple handfuls of popcorn in the afternoon too. Lately we’ve been loving the Popcorn in a Pickle from Trader Joe’s. DINNER | On Monday I made a big taco salad for dinner! This is one of my favorite meals and it comes together so quickly. 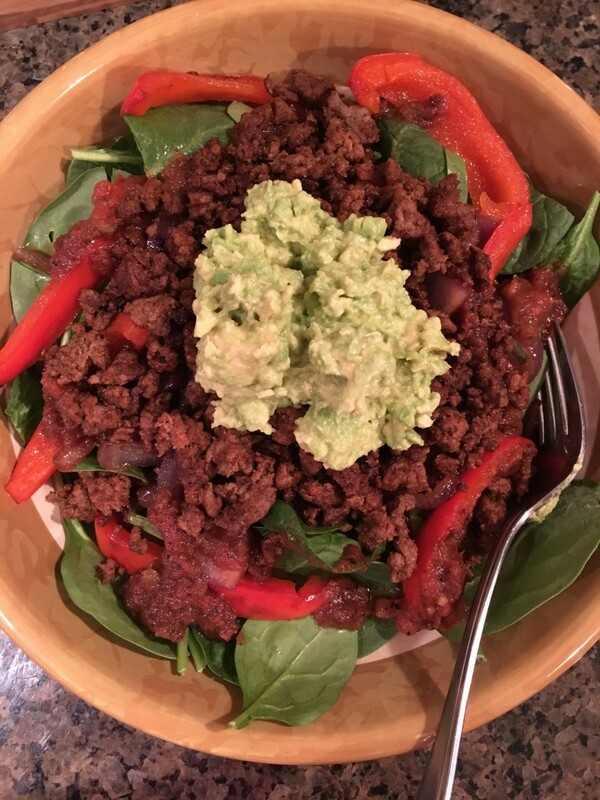 I seasoned some ground beef with homemade taco seasoning (chili powder, cumin, paprika, garlic powder, onion powder, and cayenne) and built my salad on a bed of baby spinach. I also added some sauteed red pepper and onion, mashed avocado, and my favorite Trader Joe’s Double Roasted Salsa. I could seriously eat this combo every night! I almost always have frozen fruit on hand so if I want something sweet at night I can blend up some “nice cream”. 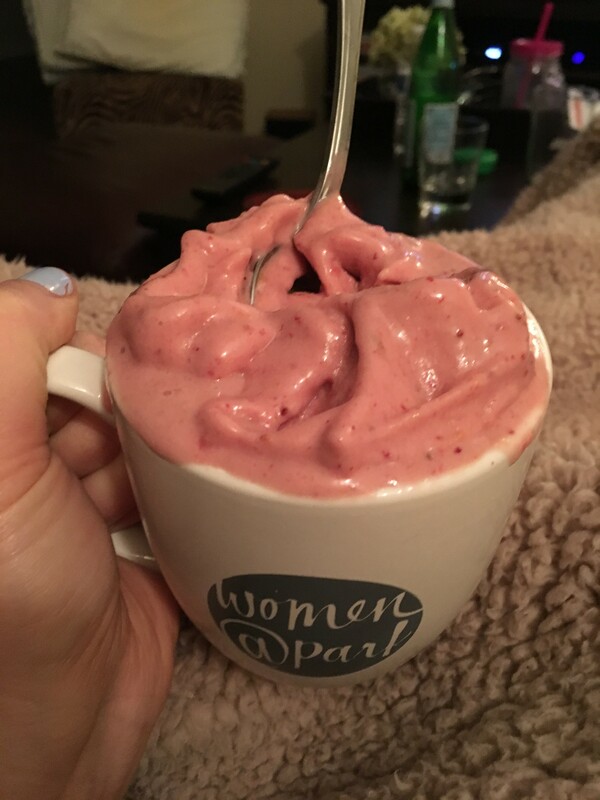 This combination was 5 frozen strawberries + 1/2 frozen banana + a splash of almond milk. This actually made a ton and it was overflowing out of my mug! Yes to the taco salad every night!! I need to imitate your homemade taco seasoning. I used one I got for free at Expo West. I think it was from Simply Organic. But homemade is always best. Mmmm your lunch and dinner are huge staples of mine. I lovveee pretty much the same taco salads – though I tend to be extra lazy and use packaged taco seasoning rather than making my own. Yours sounds delicious! I hope I can find that coconut/almond creamer. I sometimes find coconut on its own a bit too much, but lightening up with almond milk may be perfect.